Convert Pro WordPress plugin works seamlessly with all major auto-responders & email marketing providers. With unique import & export functionality, your valuable email data is now more effective & agile. One click integration makes it easy to work on a quick setup to capture and manage lead data. 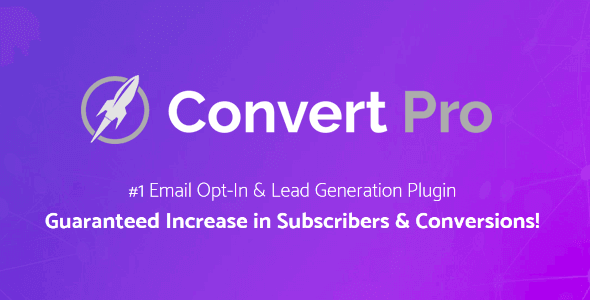 Convert Pro is the easiest and effective WordPress popup plugin that can be used by online marketers, bloggers, e-commerce websites, developers and all other small and large businesses that wish to increase conversions on their websites. It is the best plugin that will help you build email lists, drive traffic, promote videos & offers and make the most of your marketing spend. If you are looking for a marketing tool like this, Convert Pro is the best affordable option for you. Convert Pro comes with a huge library of conversion oriented professionally designed templates within a template cloud. Simply install and use only the ones you need!